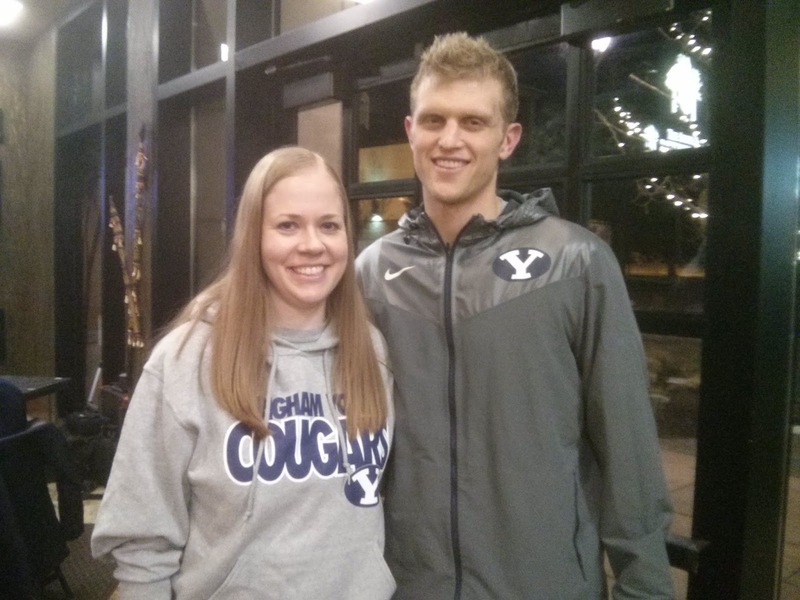 BYU Sports According to Tasha: BYU Hoops Takes Down the Zags! BYU Hoops Takes Down the Zags! You know it's gotta be good. WE BEAT GONZAGA! I'll never get tired of saying it! That game was so intense. I believed before it started that we could win . . . but I wasn't very sure that we would win. I was terrified through the whole first half that if we even fell behind by one point, we'd panic and blow the whole thing. It's so much easier to keep a lead than it is to play catch-up. The Zags managed to tie it at the half, but couldn't pull ahead. It wasn't until a few minutes into the second half that I started to build some confidence. We could do this; we could actually do this!! And we actually did it! The Cougars held on til the very end. I think what's even more amazing is that Gonzaga never led, and Tyler only scored 10 points! How we managed to pull all that off is astonishing. I love it, though! 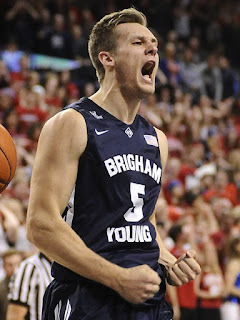 And the fact that Jarom Jordan had to shave his head on BYU Sports Nation on Monday made it even better . . . That's what happens to non-believers! One of the funniest things I've seen in a loooong time for sure. So glad they brought Skyler Halford in to do it. He had a HUGE game on Saturday! I've changed my mind in the last few weeks about the big dance-- I think, barring a first-round WCC tourney loss (which isn't gonna happen), we punched a ticket to the NCAA with that win. We're peaking at the right time, and that's never bad. How in the world could the committee leave a team out of the tourney that beat the #3 team in the country (on the ROAD on last day of February, no less) and a team that has one of the nation's top scorers AND the current NCAA all-time record holder for single-season triple doubles?! That team HAS to be in! I don't care about the "bad losses" anymore. Pepperdine scmepperdine! That Gonzaga win should make up for all of that. The fact that Kevin Pangos was named WCC player of the year (and the Zags swept the rest of the awards, too) is a total sham . . . Pangos isn't even the best player on his TEAM, let alone in the conference. My heart belongs to Tyler, but I think Kyle should have won it. Hands down. Hope they use that as motivation to go to Vegas this weekend and beat (most likely) the Gaels and Zags again. Me & Ty at the Coach Rose radio show on Tuesday. Can't wait to see him play in Vegas!! or LMU. The second and third games will be challenges, though. We should beat St. Mary's, but the odds are pretty low that we could beat Gonzaga again. I believe, though! Capping off this season with a tournament championship would be beyond AMAZING. Unfortunately, I won't make it to Vegas to see it . . . but I'll be watching every minute. Let's go get that 'ship, Cougs! P.S. Shout out to my man Tyler Haws for becoming BYU's all-time leading scorer in the Portland game last week! Such an amazing moment for an amazing player!